Early in 1961, Robert B. Voas at the Manned Spacecraft Center had written a paper on how pilots should train for a lunar mission and what they should do during the flight. Because of the hostile environment and the inability to return quickly to safety, Voas said, crews had to be prepared to stay with their ships and keep the protective systems operating. That made good sense. Moreover, since modifications were made in spacecraft systems almost until time of launch, a crew would have to follow its specific spacecraft through step-by-step testing in the factory and through preparations for flight at the launch site. In November 1967, therefore, flight crew appointments seemed to be be set for all of 1968 and part of 1969, but 1968 was an eventful year for men as well as machines. The major change, of course, was the proposal to attempt a lunar-orbit mission on the second manned Apollo flight. NASA planners reasoned that Borman's crew was already training for operations with the command module as far as 6,400 kilometers from the earth. The astronauts would have to stretch that distance to nearly 380,000 kilometers, but they would not have the lunar module to complicate their training. On the other hand, McDivitt's group appeared to have a tremendous task, training to put the lander through its paces for the first time. 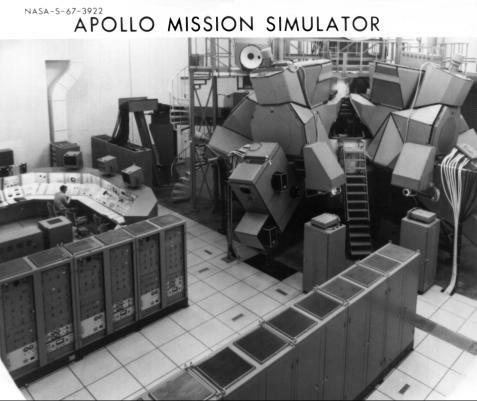 The Apollo command module mission simulator (right) at Manned Spacecraft Center, where Apollo astronauts practiced for their missions. Another simulator was at Kennedy Space Center. 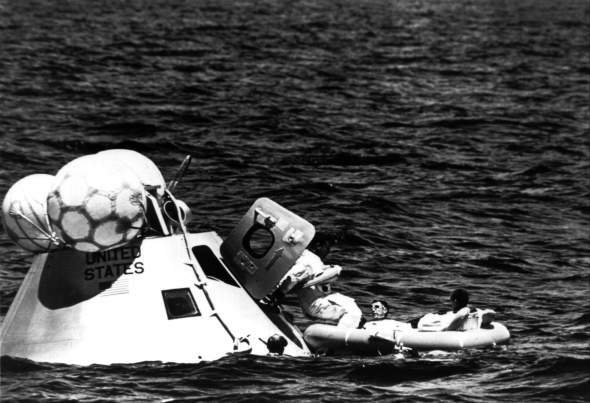 Schirra, Eisele, and Cunningham (left to right) practice climbing out of the spacecraft into a life raft, to perfect recovery procedures. 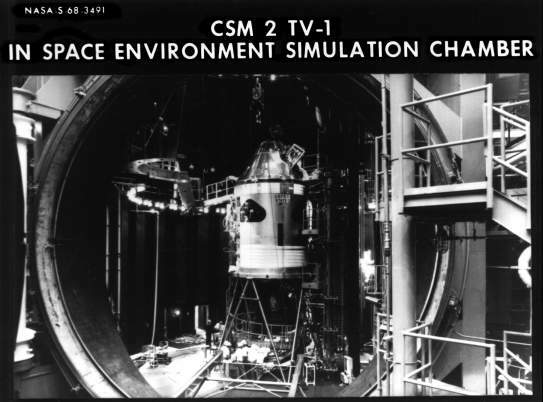 Command and service modules 2TV-1 in the space environment simulation chamber at Manned Spacecraft Center. Hinges for the huge door to close the chamber are at extreme left. Astronauts Kerwin, Brand, and Engle spent a week in this craft under operational space conditions in 1968. In addition to their flight training, the Apollo 7 crews had to exercise to keep physically fit, to guard themselves against illness, and to fly their T-38 jet aircraft from place to place to maintain proficiency in high-performance machines. Schirra, Eisele, and Cunningham had been doing this detailed work, with only an occasional night off to see a soccer match or some other sports event, for more than a year. CSM-101 had spent even longer getting ready for its voyage. * There had been other names for the crew positions. In 1966, for example, when the Grissom and Schirra crews were in training, the terminology was command pilot, senior pilot, and pilot. ** An innovation for Apollo manned flights was the support crew. For Apollo 7, this would be John Swigert, Ronald Evans, and William Pogue. Perhaps their most important duty was coordinating and maintaining the Flight Data File, which included the flight plan, checklists, and mission ground rules, making sure that these were kept up to date and that the other crews were informed of changes. The support crews used the simulators to work out procedures, especially for emergency situations. Thus, when the prime and backup teams trained on the simulators, procedures were ready and they could devote their time to mastering then. In countdown tests, the support crews set up the cockpit, making sure that all switches were in the proper positions. Swigert, Evans, and Pogue also stood by during spacecraft tests on the pad, to assist the prime or backup crew to get out in case of emergency. *** Clifton Williams, the third member of McDivitt's backup crew, had been killed in a T-38 aircraft crash on 5 October 1967 and was replaced by Bean. 13. [Robert B. Voas, STG], "Preliminary Material for the Selection and Training of Astronauts for Advanced Space Flights, for publication in Aerospace Engineering," 31 Oct. 1961; Donald K. Slayton memo, "Block II Apollo flight crew designation," 29 Nov. 1966; Col. Frank Borman to Dale D. Myers, "Crew Nomenclature," 31 May 1967; Low memo, "Apollo crewmen designations," 14 June 1967; MSC news release 66-72, 29 Sept. 1966. See also Robert R. Gilruth and L[ee] N. McMillion, "Man's Role in Apollo," Aerospace Engineering 21, no. 9 (1962): 42-48. 14. MSC, "Gemini and Apollo Crews Selected," news release 66-20, 21 March 1966; MSC release 66-72; MSC news release 66-110, 22 Dec. 1966; Michael Collins, Carrying the Fire: An Astronaut's Journeys (New York: Farrar, Strauss and Giroux, 1974), p. 267. 15. Senate Committee on Aeronautical and Space Sciences, Apollo Accident: Hearings, 8 parts, pt. 6, 90th Cong., 1st sess., 1967, pp. 463-64, 517; "Webb Names Crew For Manned Apollo," MSC Roundup, 12 May 1967; MSC release 67-22, 9 May 1967; John J. Van Bockel, telephone interview, 17 Oct. 1975; Borman to Myers, "Plan for Flight Crew Support Team Duties and Responsibilities during Spacecraft Checkout," 14 June 1967, with enc. 16. NASA, Astronautics and Aeronautics, 1967, p. 350; MSC news releases 67-67, 20 Nov., and 67-58, 5 Oct. 1967. 17. MSC, "Gen. Phillips Notes, 17 August 1968"; Collins, Carrying the Fire, pp. 296-97. 18. Collins, Carrying the Fire, p. 288; MSC news releases 68-53, 22 July, 68-54, 23 July, 68-60, 8 Aug., and 68-48, 16 July 1968; Quarterly Status Rept. no. 25, 30 Sept. 1968, p. 57. 19. NASA, Nineteenth Semiannual Report to Congress, January 1-June 30, 1968 (Washington, 1969), p. 29; Borman to Myers, "Flight Crew Participation in OCP's," 15 June 1967; JSC, Apollo Program Summary Report, JSC-09423, April 1975 (published as NASA TM-X-68725, June 1975), p. 6-1; NASA Astronauts, NASA EP-34 (Washington, October 1967), p. 40; Quarterly Status Rept. no. 25, p. 57; MSC news release 68-57, 31 July 1968; Quarterly Status Rept. no. 24, p. 1; Low to Julian Scheer, NASA Hq., 10 July 1968; Richard W. Underwood to Chief, MSC Photographic Technology Lab., MSC, "Apollo VII crew briefing for Experiments S005 and S006," 20 Sept. 1968; Warren J. North to Chief, Procurements and Contracts Div., "Sole source justification for procurement of services and utilization of the Griffith Planetarium for Apollo flight crew celestial training," 22 April 1968, with enc. ; MSC, "Establishment of Crew Systems Resident Office at KSC," Announcement 68-88, 27 June 1968; Low to NASA Hq., Attn. : William C. Schneider, "Apollo 7 suit planning," 10 Aug. 1968; Richard S. Johnston to Nisson Finkelstein, 5 July 1968. 20. Kleinknecht to Scott H. Simpkinson, "Critique of spacecraft 101 integrated test (OCP-0131)," 14 May 1968, with enc., John W. Young memo for record, "Recommendations resulting from participation in OCP-0131 Integrated Systems Test in S/C 101," 29 April 1968. 21. Slayton to Dir., Flight Ops., "Crew report on 48-hour recovery test of spacecraft 007 on April 5-7 1968," 12 April 1968, with enc. 22. MSC news release 68-42, 10 June 1968; Joseph P. Kerwin, Vance D. Brand, and Joseph H. Engle memo, "Crew Report," 2 July 1968.